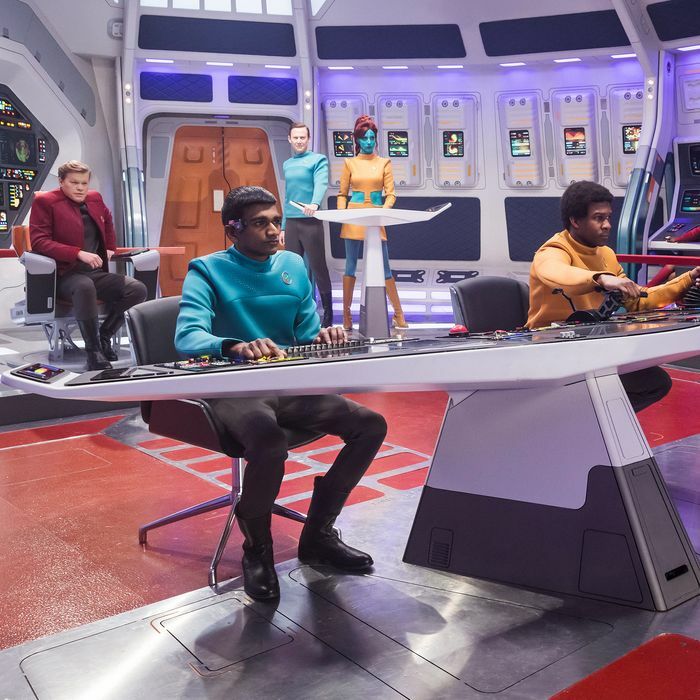 The first few scenes of Black Mirror’s standout season-four episode “USS Callister” look like a facsimile space adventure along the lines of Star Trek: The Original Series or the original Battlestar Galactica. But when the story expands, we realize that we’re seeing everything from the perspective of a single character: Robert Daly (Jesse Plemons), an obsessive fan of a TV show called Space Fleet. Daly is playing a virtual-reality game that he based on the show, and he’s torturing copies of his co-workers inside of it. When a new employee named Nanette Cole (Cristin Milioti) gets caught inside of Robert’s game, we begin seeing things from her perspective — and when she eventually takes over the ship, the world reboots into something more futuristic, in what Black Mirror’s series production designer Joel Collins deems “the J.J. Abrams reboot” of the show-within-a-show’s universe. Working closely with creator Charlie Brooker and producer Annabel Jones, Collins has overseen the production design for every Black Mirror episode. We spoke with him ahead of the season-four premiere about designing and developing the layered world of “USS Callister,” building their own Space Fleet merchandise, and how to spot subtle shout-outs to other Black Mirror episodes. Inside the world of Robert’s Space Fleet–like mod of his VR game, the characters wear primary-color outfits, carry around blasters, and operate a bridge that looks a lot like something you’d see in Star Trek — though, of course, Black Mirror couldn’t directly mimic the show. “We needed the show to be identified by the audience as the type of thing they’d seen or could accept having seen,” Collins said. “At the same time, we couldn’t copy anything without getting into a lot of trouble.” To that end, the episode references shows like Star Trek and the original Battlestar Galactica, specifically the sorts of series that built immense, complicated universes that drew in superfans like Plemons’s character. “It needed to have the volume that some of those shows have had,” Collins said, noting that episode director Toby Haynes and his team poured over the little details, like the terminology for aliens or machinery. “The enjoyment for Toby and Charlie lies in coming up with all the silly names,” he said. This “could be seen as a little embarrassing, making a chintz spaceship, the way it was made 50 years ago, in the 1960s and ’70s,” he added, noting that it’s a departure from the sleeker, near-futuristic Black Mirror house style, which you can see in the offices of Callister itself, which seem like they could exist only a few years into our future. Finally, once Nanette figures out a way to escape Robert’s universe, we arrive at the “J.J. Abrams–style” reboot of the series: a reimagining of the Space Fleet universe, where everyone wears more reasonable costumes and — in a cheeky nod to Abrams’s style — there are a lot more lens flares. “The way we wanted the ship to feel in the end was the way you would see it from a rebooted perspective,” Collins said. Did you catch the “San Junipero” reference? Though it’s not often apparent, Black Mirror episodes often include small links to other episodes, despite the fact that they stand apart tonally and narratively. In this case, the technology Robert Daly uses to access his game is a kind of neural implant, which bears the logo of TCKR Systems. You’ve seen that brand before in “San Junipero,” as the company behind the software that allowed Kelly and Yorkie to live on into the afterlife. (Another Easter egg within that episode, Collins pointed out, is that the bar inside San Junipero is called “Tucker’s,” an extension of the company’s acronym.) You’ll also see TCKR Systems elsewhere this season in “Black Museum,” which tells stories about their early experiments gone terribly awry. “I’ve developed all the different tech and tried to choose where it goes with Charlie and Annabel,” Collins said. In this case, the idea is that TCKR developed this technology early on in the Black Mirror universe, it was adapted into what we see in “San Junipero,” and now, as with every tech development, it’s being used by gaming companies. That might sound like a lot of extra effort, but Collins said he’s used to designing merchandise within Black Mirror episodes. “Black Museum,” for instance, is full of branded trinkets and even audio guides that are available on “Nosedive”-style phones, while season two’s “The Waldo Moment” was all about a fictional toy. “If you look at a lot of the show, there’s a need for merchandise,” he said. If you’re imagining our dark capitalist future, after all, someone will definitely be selling things.